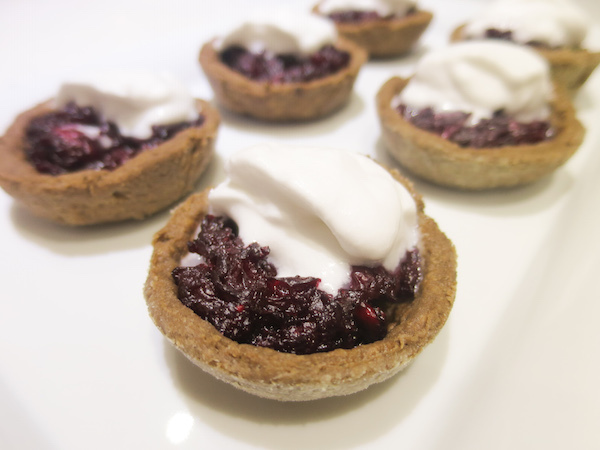 A healthy recipe to end the month of January 🙂 I was positively surprised on how delicious these mini cherry pies without dairy, eggs or refined sugar turned out and couldn’t wait longer to share the recipe with you. This recipe was born from the request of our tea guests on Friday night – my father-in-law asked for a dairy free dessert preferably without sugar. 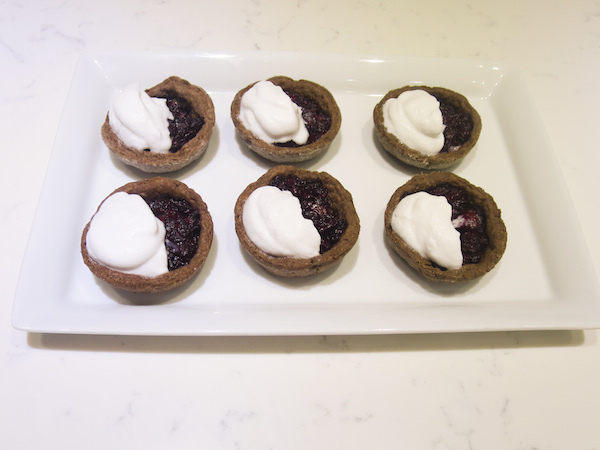 So I made these mini pies from few ingredients we had at home… I used One Tribe Organic Coconut Oil, frozen pitted sour cherries and Aroy-D Coconut Milk (here it’s sold as Coconut Liquid, but it’s coconut milk with some solid lumps). The crust is really simple and you can make it with or without cocoa powder. The dough is enough for one regular sized pie and makes about 15 mini pies (I made 12 according to the muffin tin, and had some leftover dough). Leftover dough gets really hard when refrigerated but can be used again after bringing to room temperature. I suppose a couple days in fridge is fine and it should even keep longer in freezer, but I have not tried that yet. The pies have a very light taste of coconut and I’d say that’s purely from the whipped coconut milk on top as it’s strangely not tasting in the crust. 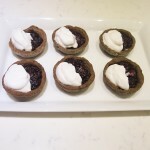 So don’t be bothered about that – if you do not like the taste of coconut, you can totally leave the whipped coconut milk out and enjoy the cherry pies on their own. If you try this recipe, please let me know how you like them! I’d love to see your comments, ratings and pictures! 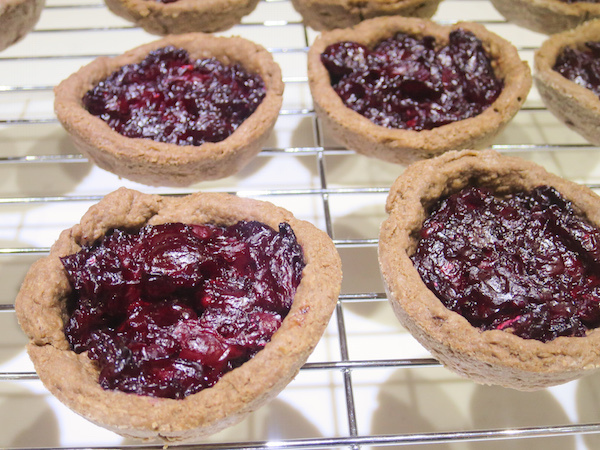 Delicious vegan cherry pie recipe without refined sugar. Preheat oven to 200 ºC (392ºF). 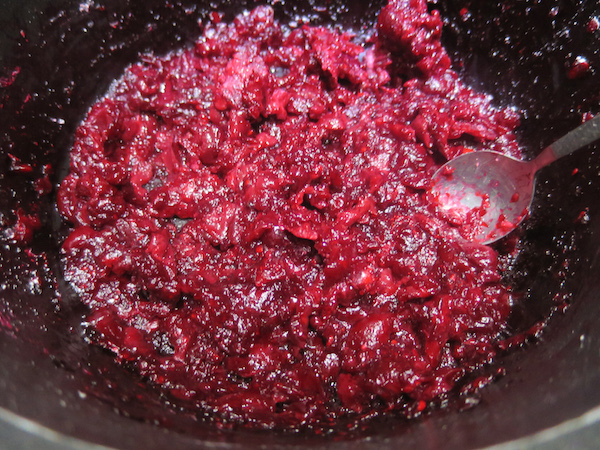 Place cherries in a medium saucepan and cook over medium heat for 10 minutes. In a small bowl combine cornstarch and stevia and add the mixture to pot with cherries in their juice constantly stirring, continue to cook for 2 minutes until the mixture thickens. Remove from heat and allow to cool while preparing the crust. In a mixing bowl combine flour, salt and cocoa powder. Add coconut oil in tablespoon sized chunks and using a fork cut the flour mixture and oil together. Add ice water in small additions at time and keep mixing until it forms a dough. Lightly knead the dough with your hands and turn it on a floured surface, roll into 3 mm (0.11 inch) thick and cut out rounds using a large cookie cutter or a jar lid. By using a spatula gently lift the crust and transfer into a muffin tin. 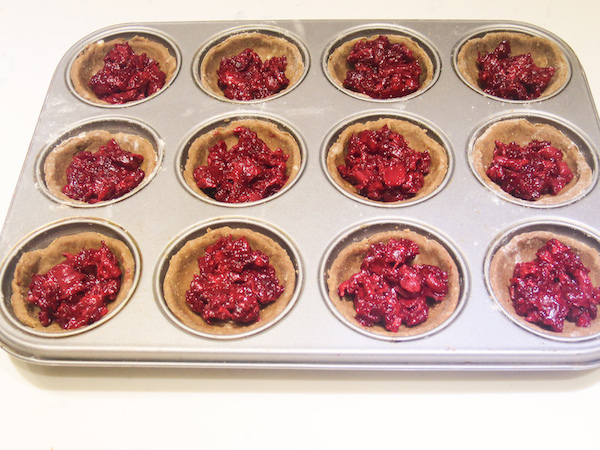 Fill with cherry filling and bake in preheated oven for 25 minutes. 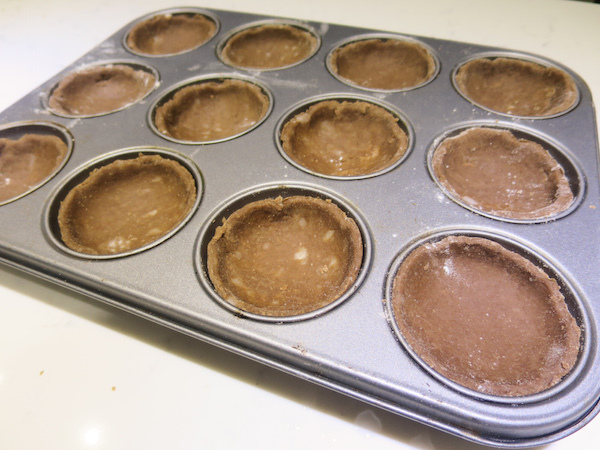 Remove from the muffin tin and allow to cool for few minutes on a wire rack. In a mixing bowl beat the coconut milk until smooth and creamy. Spoon onto the pies or serve on the side. Enjoy!